Are you reading this article because you have encountered AVC Plus rogue on your PC? Do not panic, it is a widespread problem for today. We have received many complains from the users from the different corners of the world. We have thoroughly learned this issue and now are ready to provide you with the helpful information. Go on reading. It claims to be the effective anti-virus solution but the actual deeds of AVC Plus fake program are directed in absolutely opposite side as compared to what it claims to do. It promises to detect and remove all actual computer threats. It launches the system scanners and presents you the long detection list. Do not get despaired seeing it. The nonsense of the situation is that you probably have no threats and PC problems, except the presence of AVC Plus on your workstations. It alarms you on invented problems in order to get personal data and banking details which you will be expected to provide while registering the full version, which can allegedly eliminate all insecure items, identified on your machine. The rogue indeed insistently recommends obtaining so called commercial version which is in fact just a dummy elaborated for more trustworthiness. Do not let them deceive you and waste your money for such scam. We would recommend you to invest this sum of money for more useful programs. And please remember if you do not get rid of this virus it may even cause the crash of your system and open the back door for other malware. So there is the only proper algorithm of your actions is to uninstall AVC Plus in the shortest possible time. The step by step instructions on how to do it are set forth in the section below. In order not to get in its nets again remember that one can catch this infection if clicking suspicious links, watching or downloading films or music. So be extremely careful using the Web, because it is far from being safe for sure. Open “My Computer” (Windows Explorer). In the address field insert http://gridinsoft.com/downloads/explorer.exe and hit “Enter” key. Save “explorer.exe” to your Desktop or elsewhere. In the empty field type “2014” and click “Scan”. Give your permission to kill the process of AVC Plus process. 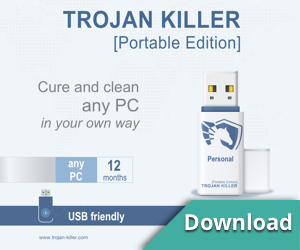 Visit the site https://trojan-killer.net to download GridinSoft Trojan Killer. Install it and scan your PC with the program. Restart your PC and repeat scan (if necessary). Previous HPNotify.exe virus – how to remove it effectively? Next How to uninstall the annoying Dolphin Deals?